It is always interesting to read accounts of the war from the perspective of the opposition. 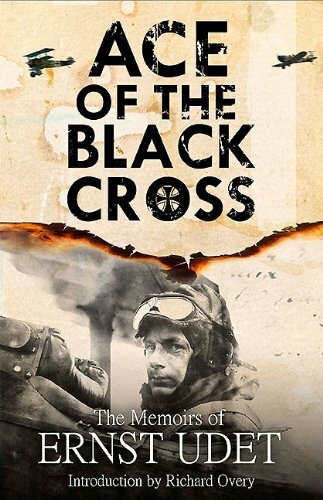 This is the first memoir of a German pilot that I have read, but it immediately struck me how similar the character of the German pilot was to that of his British counterpart. Ernst Udet enlisted aged 18 into the fledgling German Air Service, and served throughout the war. With 62 victories he became an ace second only to the Red Baron, whose infamy has possibly eclipsed Udet’s reputation. Despite his high tally of kills, he got off to something of a rocky start. In his first dogfight he froze, unable to pull the trigger against his opponent. Believing himself to be a coward, he vowed to make amends. Amongst the almost casual accounts of aerial combat, admissions such as this give a bit more insight into the man; describing how he had to write letters to the families of his dead comrades serves as a reminder that the life of the airman was a dangerous one. The chivalric nature of the war in the air is apparent in Udet’s writing; on one occasion French ace Georges Guynemer disengaged from a dogfight with Udet when he saw that his opponent’s gun had jammed. This shows the sense of comradeships between pilots, even when they were on opposing sides. Udet recounts his dogfights with almost a sense of boyish excitement, and as his victories began to mount up, he almost detaches himself from the killing. The thrill was in the duel between the airmen, trying to outwit the enemy to ensure survival, thoughts of the pilot flying the machine almost secondary to this. Yet sometimes this mask slips as Udet found himself wondering about the men he had shot down. He does not dwell much on his own mortality despite a number of close calls, including narrowly avoiding death when parachuting form his stricken plane. His talents got him noticed and Udet was selected to join von Richthofen, and was soon given the role of commanding one of his flights; on sick leave when Richthofen was shot down, the Red Baron’s death affected him deeply. Against medical advice he returned to flying and had a bird’s eye view of the British advance on the Somme of summer 1918. In August of that year he shot down 20 enemy aircraft in a 22 day period. He briefly served under Hermann Göring before the war ended; he was just 22. The latter third of the book deals with his post-war exploits in the 1920s. Like many ex-servicemen he struggled to readjust to civilian life, and was involved in various commercial flying ventures, international air races, and aerobatics that took him all over the world, seemingly trying to recapture some of the excitement that flying in the war had given him. His memoir was published in 1935 and does not cover his role in the Nazi party as Director-General of Equipment for the Luftwaffe, a role that eventually led to him committing suicide in 1941, and a period of his life that is worthy of a book in itself. It seems a rather ignoble end for someone who had fought in the First World War with such distinction; in fact his suicide was covered up at the time and his death attributed to an accident. Somewhat fittingly he is buried next to von Richthofen in Berlin. Udet appears to have been quite a character and had an eventful war (and indeed post-war) that makes for fascinating reading.